nI 1 (I g r e a +, ..I i, e r e v, 1 e w Fall 1989 Editor-in-Chief Martin Steinberg Treasurer Lisa A. Malo Staff Marie Beshures Luann Brazill Mark Childs Cheryl Cotter Barbara Flay ton Tom Fugalli Justin Goltermann Dot Hoffman Christian Langworthy George Liveris Peter Souveroff Copyright 1989 !iJ. 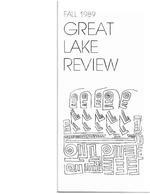 Great Lake Review All rights reserved to authors and artists. This magazine is made possible by funds provided by the Student Association and by the efforts of the students of the State University of New York at Oswego.